Here at the Sanger Institute, we often work with other Institutes to pool expertise, knowledge and skills to answer difficult questions. We recently helped a collaboration of 19 research teams from around the world to unpick the tangled genetic puzzle behind a disease of the thyroid gland, central hypothyroidism. Thyrotropin-releasing hormone (TRH) from the hypothalamus controls production of thyroid-stimulating hormone (TSH) produced by the anterior pituitary, which in turn regulates hormone output by the thyroid. 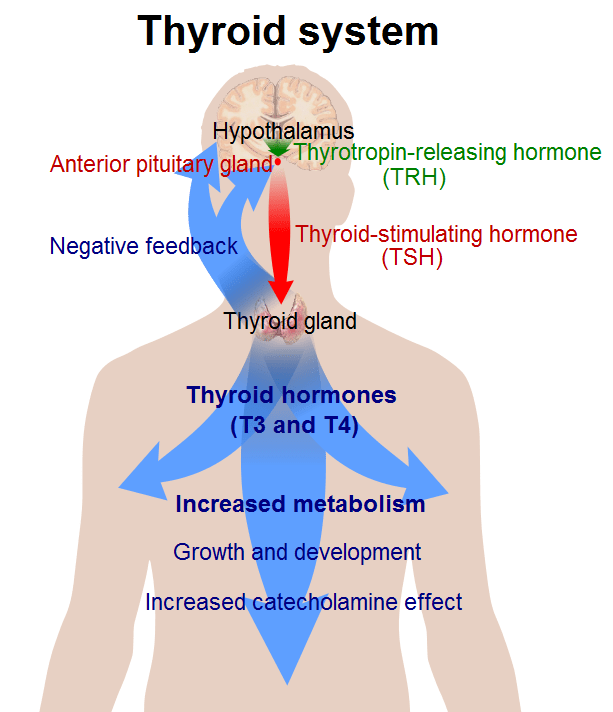 The thyroid produces two principal thyroid hormones, triiodothyronine (T3) and thyroxine (T4), which help to control how quickly the body uses energy, makes proteins, and regulate the rate of metabolism and affect the growth and rate of function of many other systems in the body. The thyroid gland controls how quickly key aspects of our body’s metabolism works, such as the rate of use of energy and synthesis of proteins. Sometimes the thyroid can be over- or under-active, perhaps due to mutation or disease within the thyroid gland cells. Rarely, in perhaps one in 80,000 people, the thyroid is normal but declines because the brain fails to stimulate it enough. A defect in a key area of the brain – the pituitary gland or the hypothalamus –­ causes the disorder known as central hypothyroidism. Symptoms of central hypothyroidism are wide ranging and include fatigue, apathy, weight gain, dry skin, constipation and cold intolerance: the disease can be very difficult to diagnose. The teams that we worked with were trying to find the genetic basis of the central hypothyroidism that had been diagnosed in eleven unrelated families. It was a tangled puzzle, and researchers from 19 labs worked together to solve it. Our collaborators sequenced parts of the genomes of people from the eleven families, searching for genetic clues. They found that all the affected people had a defect in a gene called IGSF1: in all they found ten distinct mutations in this gene. The IGSF1 protein is produced abundantly by the pituitary gland and thought to help interactions between cells. When the team examined cells containing the mutant genes, they found that the IGSF1 protein did not function properly, either because not enough of it was made or because the protein could not traffic through the cell from where it was made to where it is needed to do its job (the membrane at the surface of the cell). The research group developed mice that lacked the equivalent gene and showed that adult mice showed many of the characteristics of central hypothyroidism, helping to confirm the link between IGSF1 and this disease. At the Sanger Institute, we have established a suite of blood tests to examine the physiology of mice, measuring as many variables as possible from a single sample. Our role in this project was small, but founded on one of those skills. We tested blood from these mice to see if one particular thyroid hormone, called thyroxine, was present at abnormal levels, a small contribution to a huge overall effort. Our colleagues have uncovered a completely new X-linked disorder in which loss of function of IGSF1 causes central hypothyroidism. To scientists this represents a completely unexpected role for IGSF1 in pituitary and testicular function and acts as a springboard for further research in this field. This finding could really help patients because the correct treatment could be targeted to the subset of central hypothyroidism patients that carry a non-functional copy of IGSF1. It’s an unexpected and clinically relevant role for IGSF1 in pituitary and testicular function. A simple test could identify people carrying mutations in IGSF1 gene. If they do carry that change, then they could benefit from biochemical screening and treatment with thyroxine, the hormone we measured.